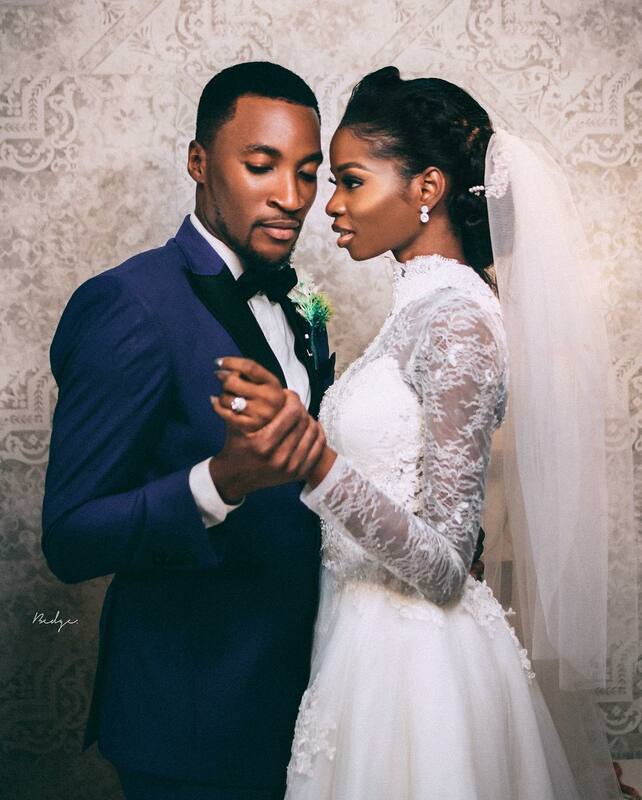 In true fairy tale style, Akah Nnani and Claire Idera tied the knot on a Monday! The newlyweds are not strangers to us. 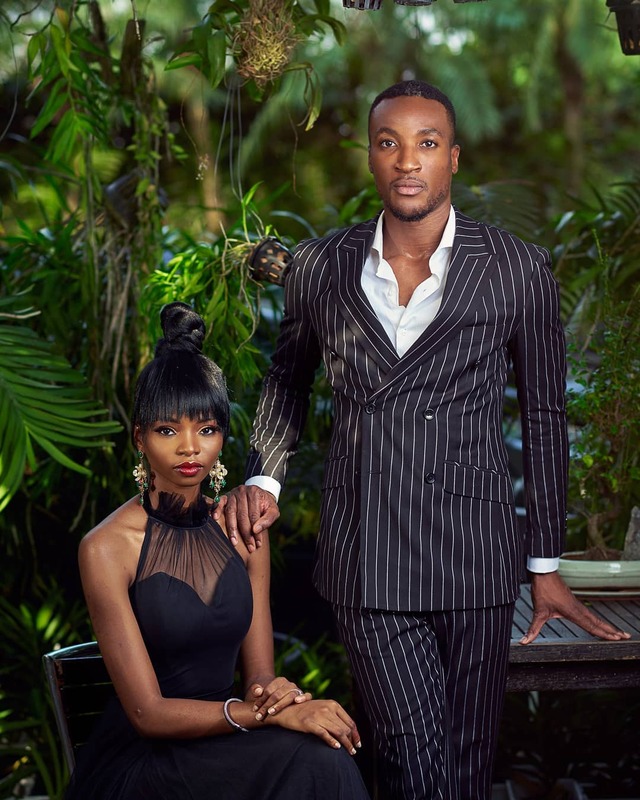 Akah is a host, popular YouTuber and actor mostly known for ‘Banana Island Ghost’ and ‘The Royal Hibiscus Hotel’ while Claire is a fashion illustrator who has worked for top brands like Hugo Boss, Vlisco and others. 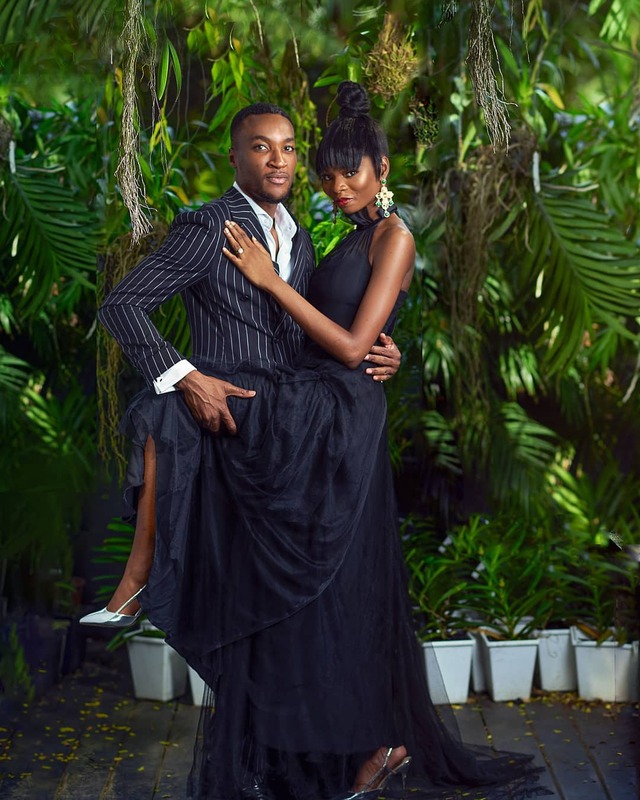 Few days before their wedding, Akah and Claire released photos from their pre-wedding shoot shot by Joel Adu on their joint Instagram page. 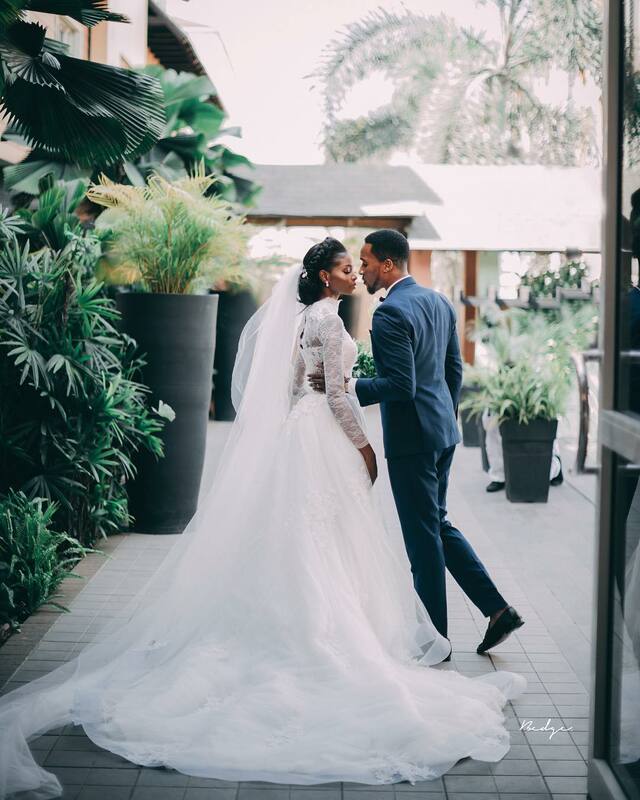 The pictures did a great job showing off the couple’s amazing style and what we should expect of their wedding. Claire wore a black halter-neck maxi dress with a pleated illusion neckline. The crisp shade of black made her beautiful skin tone pop even more. She complimented the dress with a pair of metallic silver sling-back heels and also accessorised with a pair of emerald green and gold statement earrings. She allowed her engagement ring own the whole length of her arm and hand. Akah’s black and white double-breasted pinstripe suit was the perfect colour to show off his height. The pinstripe pattern makes the suit look much more interesting while the simple crisp white shirt made the look even more classic. Their outfits came together to create a perfect look and the pair looked faultless. 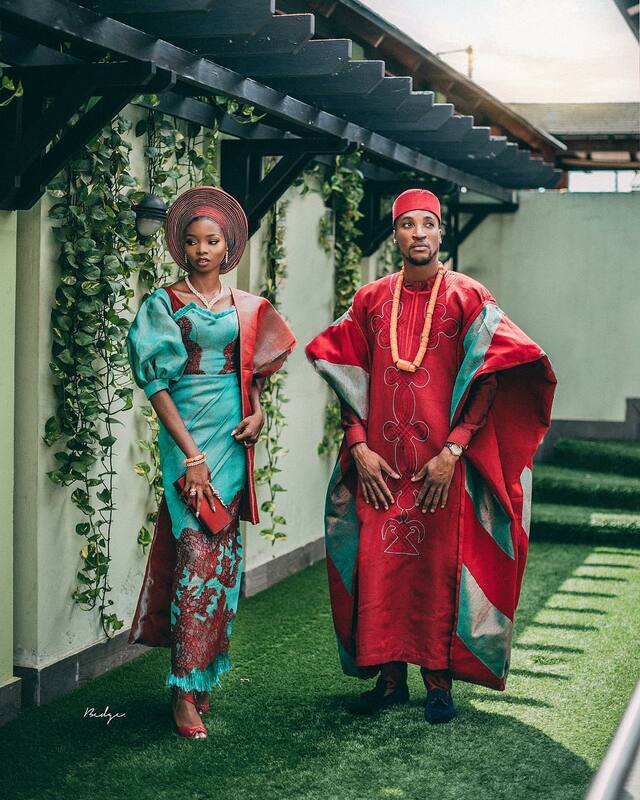 For their traditional wedding, the couple wore outfits made from the popular traditional fabric, aso oke. Akah’s Agbada was the perfect combination of firebrick red and jungle green in the right proportions with a beautiful embroidered detail on it. He complimented the ensemble with a pair of tasselled black suede loafers and a traditional neckpiece – a preferred choice for traditional attires. 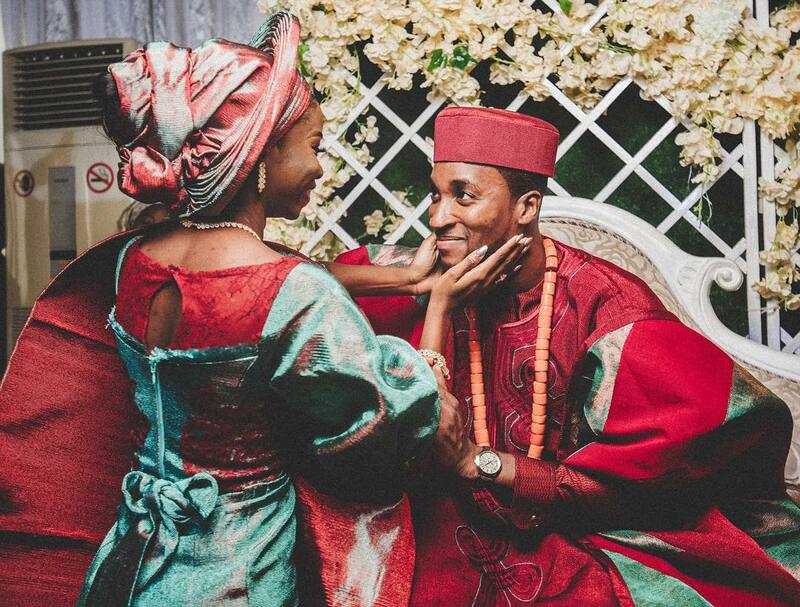 Claire looked divine in a traditional Iro and Buba combination. The blouse was perfectly cut to include more contemporary details such as the puffy sleeves and a boat neckline. The outfit was also adorned with floral laces which brought more character to it. For accessories, she went for a pair of firebrick red peep-toe shoes, a matching minaudière and feathered bridal fan. 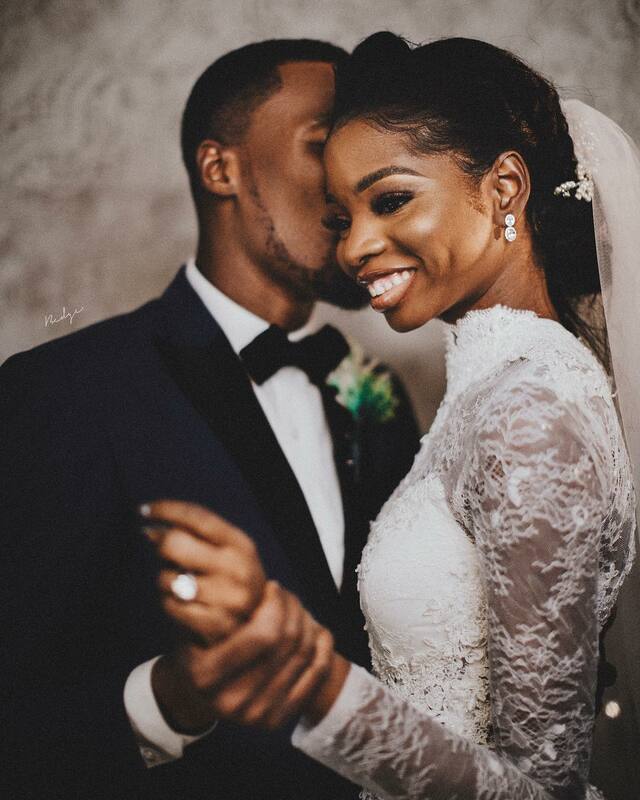 Their choice of outfits for the traditional wedding wowed us even more and further proved that they are indeed a fashionably perfect couple. Their white wedding looks were just as impressive. Claire wore a long-sleeve gown with a sweeping train by Purple Lagos. The lace appliqués and full neckline gave the dress a classic romantic feel, with the veil complementing it nicely. Akah, on the other hand, wore a dark blue suit which he paired with a crisp white shirt and a black diamond point bow tie. He finished the look with a pair of black loafers, adding a boutonniere to the jacket’s lapel for a timeless finish. 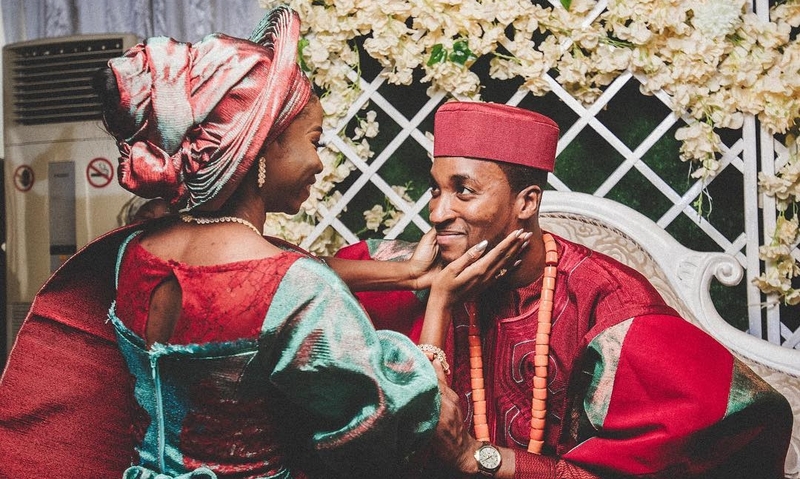 Style-wise, the couple really brought their A-game to their wedding. 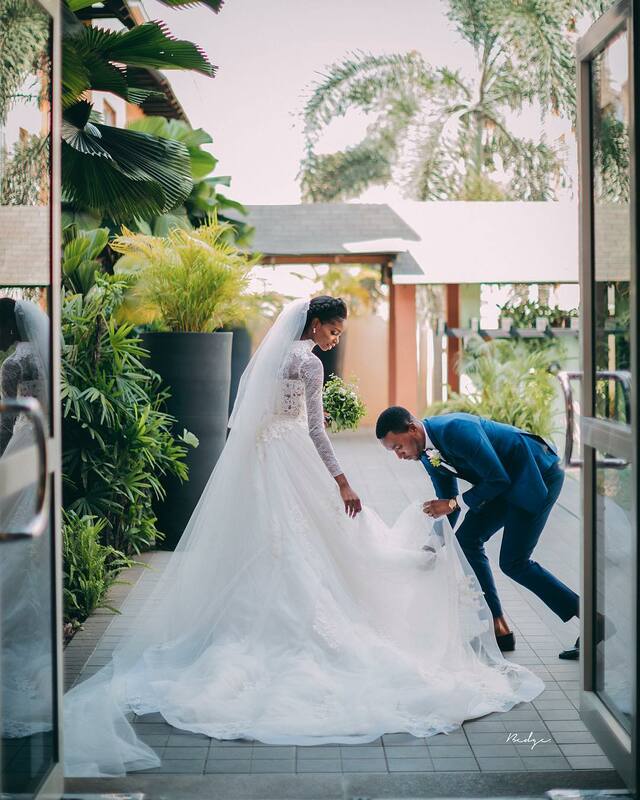 From Claire’s classic and chic outfits to Akah’s laid-back killer looks, the newlyweds created wedding memories that would leave a lasting impression.